Insert your night guard approximately 30 minutes before bedtime during the initial 2 week ‘break in’ period to adjust to the normal, initial response of excess saliva production. Over time, this will stop. Please bring your occlusal guard with you whenever you have dental work done, the guard may need to be adapted to the new dental restorations. To clean: RINSE with water (no toothpaste as it can scratch the surface), this will reduce the accumulation of tenacious tartar and stain from developing on your guard. Avoid soaking your guard in any solutions such as bleach, peroxide or any alcohol-based cleaners or mouthwashes as they can permanently damage the acrylic. 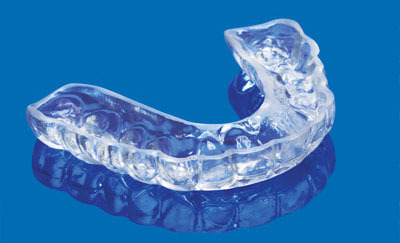 Bring it with you when you get your teeth cleaned and we will professionally clean it for you for no charge. Cautions: Pets love to chew on these. Keep it in a safe place. We recommend you store it in its container in a medicine cabinet or in a bedside drawer and never wrap it in a tissue or leave it in your pocket. The heat of a washer and/or dryer or hot water when cleaning can permanently damage or irreversibly distort your guard. Do not eat or drink (except water) with your guard in. Be sure you floss and brush thoroughly prior to placement as food and bacteria can become trapped between your teeth and guard and increase your risk of decay an stain the guard. If you haven’t worn your guard for a while and have trouble getting it in, or it is too tight after placement, it can be warmed using slightly warmer than body temperature for 20 – 30 seconds and then quickly placed in your mouth. This should soften the acrylic just enough to adjust and adapt to any pressure areas. If you experience any pain or discomfort in your jaw joints, begin having headaches or any of your teeth become tender to chew on, discontinue use of your guard and contact our office.